Noting that studies showing that BPA has harmful health effects outnumber studies that found no risk by a nine-to-one margin, Renee Sharp, head of the Environmental Working Group’s California office, said it was high time that the Golden State acted to limit children’s exposure to this troublesome chemical. EWG led the fight to pass the Toxin-Free Infants and Toddlers Act (Assembly Bill 1319). BPA is a known hormone disruptor, and studies have firmly established that infants and children are at the greatest risk of harm. The National Institutes of Health are concerned that BPA exposure in infants may lead to problems with brain development and behavior, early puberty, breast cancer and prostate cancer. Specifically, the bill would prohibit the manufacture, sale, or distribution of the above products designed for children 3 and younger that contain more than 0.1 parts per billion (ppb) of BPA. The bill would not affect any other consumer products. This is a victory for children’s health in California, but I wish the bill would have gone a step further and baned BPA all together from consumer food and drink products. We should protect babies and young children first, but prenatal exposure has potentially more consequence on health. 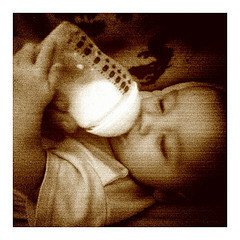 By not all and out banning BPA, we are not truly protecting our children and families. Mother Can I Trust the Government?